ULMA as a packaging manufacturer leader is always moving one step forward to updating the catalogue with the latest innovations and the state of the art technologies. As a result of these innovations, the new FR200 flow wrap machine allows, among other capabilities, allows increasing the packaging speed running much faster than previous models. This new model is equipped also with our latest motion control technology including a control based on an Industrial PC, which provides the machine with the capabilities of higher level models. 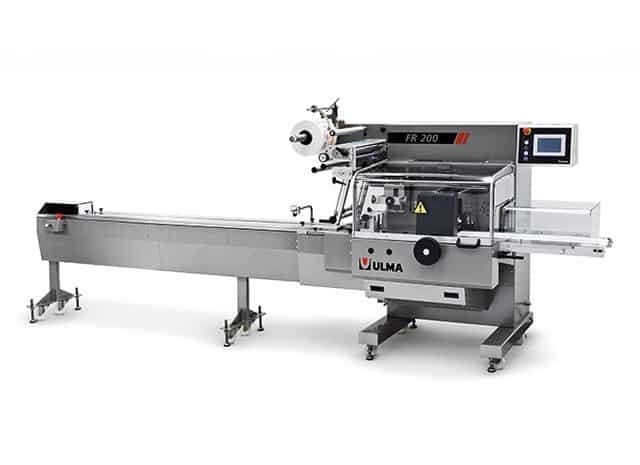 The FR200 flow wrap machine is built following the distinctive ULMA construction strength, quality and reliability. These characteristics, together with the ease of use and its ergonomics ensure the FR200 satisfies the needs of a wide range of applications. Al Thika Packaging company is the exclusive distributor of ULMA Packaging in the Middle East. Since 1994 Al Thika has been supplying packaging machineries including flow wrap machine (HFFS), vertical wrapping (VFFS), tray sealer, thermoforming, stretch film wrappers and sealing machine for food and non-food industry in Dubai, Abu Dhabi, Sharjah, Fujairah, Ras Al Khaimah, Ajman, Umm Al Quwain, Al Ain – UAE, Saudi Arabia, Muscat, Oman and the many other Gulf countries. Cantilever construction which facilitates easy access for sanitation. Self centring reel holder provided with a brake system. Infeed conveyor 2 m (6 1/2’) long. Machine control system by 7” UPC Industrial PC. HMI through a 7” colour touch screen. Offers graphical visualisation for parameter setting, alarm identification, Ethernet connection for remote interaction and visualisation. This version is specifically designed to pack groups of peppers in combination with a weigher, allowing the machine to create variable length packages. The bag length is regulated in accordance with the product’s length measure by a photoelectric sensor located in the infeed conveyor. Allows also working on a fixed bag length mode, and running print registered film. Possibility to use the machine to pack products in tray. Photoelectric sensor for centering of print registered film (continuous run version). Double self-centering film roll holders.